Y strainers are a reliable yet inexpensive way to mechanically remove unwanted solids from liquid, gas or steam lines. This is achieved by means of a perforated or wire mesh straining element. These are used in pipelines to protect pumps, meters, control valves, steam traps, regulators and other process equipment. 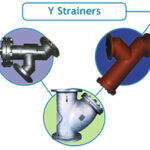 Y strainers have the advantage of being able to be installed in either a horizontal or vertical position. 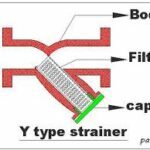 However, in both cases, the screening element must be on the “downside” of the strainer body so the entrapped solids can be properly collected and held for disposal. They are most commonly used in pressurized lines, gas or liquid, but can also be used in suction or vacuum conditions. Advanz offers a wide range of filtration levels, from 1/8” perforations, down to 500mesh (0.001” = 25micron), and also replacement straining elements, with very competitive prices and short delivery times.